EASTHAMPTON, Mass., May 19 /CSRwire/ - Prosperity Candle, a social enterprise and gift company, announced today they’ve been awarded B Corp Certification by B Lab. This rigorous certification is given to organizations that meet higher standards of social and environmental performance, transparency and accountability. Prosperity Candle helps women in regions of conflict and natural disaster start their own businesses and connects them with a global marketplace for their handmade products. In the U.S., Prosperity Candle provides living wage work opportunities for women refugees. The company has seen growth every year since launching in 2010. “Joining the community of certified B Corporations is an important step in the evolution of Prosperity Candle. 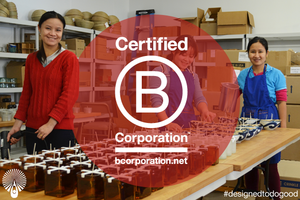 As we move forward in our mission to provide opportunities for women and families to thrive, achieving B Corp Certification distinguishes us amongst our peers in the gift industry and helps grow both our impact and sales,” said Kim Hutt, the organization’s marketing manager. Over the last year the company moved into new headquarters in Easthampton, MA, introduced a full line of new products, launched private label production, and grew their customized corporate and event gift offerings. B Corp Certification is the latest step in the growth of their business. “We are incredibly proud to join a business community that shares our values, that emphasizes the importance of social and environmental responsibility in every decision, and that recognizes the difference between good marketing and a company truly doing good. We’re excited to be associated with organizations working to make a difference in the world, and hope that B Corp Certification demonstrates to customers and investors that our products and the way we run our business are a great match for their values,” commented Ted Barber, co-founder of Prosperity Candle. In cooperation with its non-profit partner organization Prosperity Catalyst, Prosperity Candle is currently working with women entrepreneurs in Haiti, widows in Iraq, and women refugees in Springfield, MA. Prosperity Candle offers unique and beautifully designed gifts for all occasions at www.prosperitycandle.com. Businesses and nonprofits seeking customer, employee, event and donor gifts are encouraged to view Prosperity Candle’s custom gift options at http://custom.prosperitycandle.com. Prosperity Candle is a social enterprise that partners with women entrepreneurs in and from some of the most distressed regions around the globe. We work with women from places like Haiti and Iraq to start candle businesses with access to local and global markets. In the U.S., we work with recently resettled refugees from places like Burma who are rebuilding their lives after loss and years of hardship. Our focus is on creating real and sustainable market opportunities as we believe that a key component of poverty alleviation is a market-based solution that complements traditional aid. Our shared prosperity model is designed to fill the gap between vital vocational programs delivered by our nonprofit partners and a viable means to earn above a living wage and support a family. At Prosperity Candle, we believe that it’s not enough to survive. Everyone deserves the opportunity to truly thrive. To learn more about Prosperity Candle’s mission and story, please visit www.prosperitycandle.com/pages/about-prosperity-candle. Certified B Corporations meet rigorous standards of social and environmental performance, legally expand their corporate responsibilities to include consideration of stakeholder interests, and build collective voice through the power of the unifying B Corporation brand. As of June 2013, there are more than 750 Certified B Corporations from over 60 industries and 27 countries, representing a diverse multi-billion dollar marketplace.